The building on the right in the old black and white photograph, above left, is the Metropolitan Methodist Church. It was converted into Michaelis Gallery in 1916 by Joseph Michael SOLOMON. Greenmarket Square was always dominated by the Old Town House, which was built as a prestige symbol of law and order. The foundation stone was laid in 1755 by Barend Artois, a member of the Court of Justice. As the settlement expanded it had been necessary to form a Burgher Council and Burgher Watch. Fire was an ever-present hazard and the streets needed patrolling nightly by the Burgher Watch - much resembling the men in Rembrandt's famous painting The Night Watch. Originally these civic bodies met in a small thatched building on the same site as their splendid new premises, which were ready for occupation by 1761. The baroque facade is attributed to Matthias Letter, son of a stucco-sculptor from Augsburg. The urns on the pierced parapet and balcony were toppled by the earthquakes of 1809 and 1811. Otherwise, excepting for a few details, the frontage has remained almost unaltered over the centuries. When proclamations were read from the balcony overlooking Greenmarket Square, the populace were summoned from the bell tower on the roof. By 1829 this procedure was no longer necessary and a new tower was designed in the classical manner, by the government architect SKIRROW. It was intended to take the old clock from the Dutch Reformed Church - but this eventually ended up in the spire of old St George's Cathedral. Earlier this century SKIRROW's tower was replaced by one of more suitably baroque design. In 1804 J A de Mist, Commissioner General of the Batavian Republic, presented their coat of arms to the citizens of Cape Town. This hung above the doors onto the balcony, in place of the baroque cartouche bearing the figure of Justice. 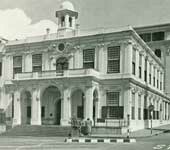 From this time onwards the Old Town House was used for civic affairs until the City Hall was completed early this century. When no longer in use for civic purposes the building fell into disrepair, the interior being partitioned into a rabbit-warren of small rooms. Then, when Sir Max Michaelis donated his collection of 17th-century Dutch art to the public, it was decided that the building would be an ideal venue. Lady Florence Phillips worked behind the scenes to get the Old Town House restored and have Michaelis donate the collection. 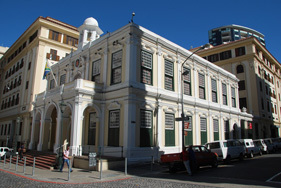 The architect commissioned to refurbish the Old Town House as an art gallery was J M SOLOMON, a brilliant young man from the firm of SIR HERBERT BAKER. He altered the exterior but little, but the interior was richly appointed, an outstanding feature being the star-spangled dome above the double stairway leading up to the paneled galleries of magnificent paintings. A cutting is preserved in the Archives of the Gallery, written by the late Mr. W. R. Morrison, and published in the Cape Times of 1st September 1916, describing in great detail how "under the fostering care of Mr. Solomon the barnlike shell, cumbered with mean rooms and stairways, disfigured with boarded ceilings, and littered with unsightly partitions, was transformed into an architectural gem". It has been said that the new interior was modelled on that of an old Dutch Guild Hall. It is unlikely, however, that he intended slavishly to reproduce a particular interior, nor is it likely that he could have succeeded in doing so satisfactorily within the limits of the available space, bearing in mind that he was obliged to adapt his ideas to a fixed ground plan. However that may be, there are few who will not feel pride in what a South African-born architect of such great accomplishment as the late Mr. Solomon achieved with so much good taste and in such complete harmony with the graceful exterior of the building. The only change made to the exterior was the heightening of the centre arch, which now unfortunately cuts into the lower moulding of the balcony which has been given a pierced balustrade above the central arch. The new gallery was opened on the 8th May 1917.